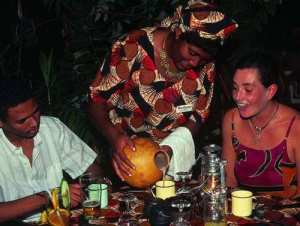 The Boma Restaurant - It is an experience! "More Than a Night out - The Boma is an Experience"
An unforgettable African experience infused with Zimbabwean cuisine, The Boma- Place of Eating is a Must Do whilst in Victoria Falls. Partially open to the African skies, it offers a unique experience that bombards the senses with the tastes, sights, sounds and smells of Africa - together with the warmth and hospitality of Zimbabwe and it's people. "The Boma - Place of Eating"
Specialising in a superb selection of traditional Zimbabwean dishes, The Boma offers a four-course meal combining a mouth watering choice of starters from the kitchen, soup from the campfire and a substantial barbeque buffet served on cast iron plates. 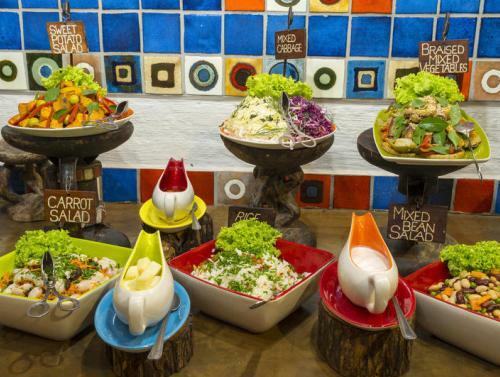 They offer a wide variety of salads from the salad bar and to follow a choice of delicious desserts from the buffet area. Everyone’s tastes are catered for and whilst the adventurous are enticed with local delicacies such as Mopani worms and game stews, those wishing to enjoy beef, pork, fish and chicken or a variety of vegetarian meals are welcome to do so. The Boma is renowned for its warthog fillet. The Boma vehicles pick up from hotels and lodges from 19h00 to and guests arrive at about 7h15, so they are seated by about 19h30 for an evening filled with entertainment. Guests are welcomed with a traditional greeting in the local languages, Shona and Ndebele. The guests are then dressed in ‘chitenges’ (traditional robes) and prepared to enter the main enclosure. 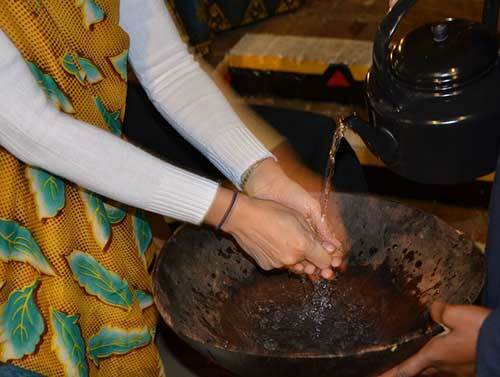 They are invited to take part in a hand washing ceremony before sampling traditional beer and snacks, as a prelude to dinner. Traditional customs, such as local beer tasting and hand-washing are observed and the atmosphere is accentuated by Ndebele song, dance and culture. 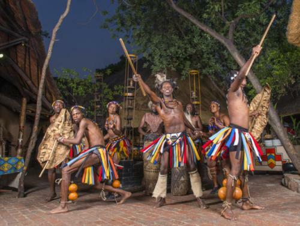 A feast of nightly entertainment incorporates Amakwezi traditional dancers, singers, a local story teller and a Sangoma (traditional healer). 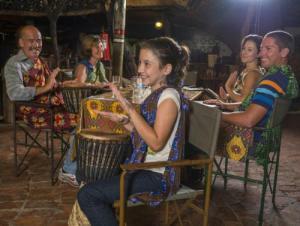 After dinner, guests are invited to join in the drumming extravaganza. This is the highlight of the evening and all are invited to participate in the drumming and dancing show with their renowned drummers – Amazulu. The drumming and entertainment show is an interactive one - great for the kids! Guests should dress casually and bring along light but warm clothing for the months of May, June, July and August. 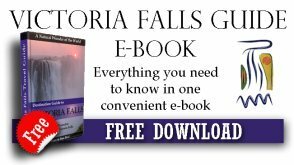 The Boma is adjacent to the Victoria Falls Safari Lodge complex. A Boma Dinner may be booked through us, which would include transport to and from your accommodation. 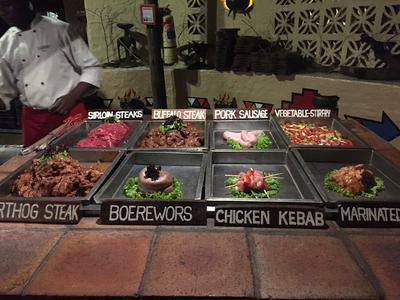 Have You Had a Meal at The Boma Restaurant? What was it like?... was the service good?...what kind of food did you have?... what was the atmosphere like?... was it good value for money and would you recommend it to others? Scroll down to read reviews from other diners.